Dust off the shofar and pick up some challah bread because Rosh Hashana falls between September 24th and September 26th this year. A time of both remembrance and renewal, the Jewish New Year is a time to ponder one’s actions from the preceding year and seek resolution for any conflicts or settle any debts, both figuratively and literally, so that one might start the year anew. In the language of flowers, the humble statice flower is symbolic of both remembrance and forgiveness and is the perfect bloom to bring home to the table to set out next to the apples and honey. Wrap up the last year and start the new one off right with a few stems of statice. Sometimes called sea foam or misty blue, the statice flower has a flattened, green stem with an almost papery covering, rather than true leaves. Cut long with arching branches, these stems hold colorful petals that come in a wide spectrum of purples and blues, and have a similar papery feel to them. This feature allows statice to remain remain fresh looking for weeks in a vase. Since flowers will keep their color for a long time, statice is a popular dried flower that will last well through the high holidays. 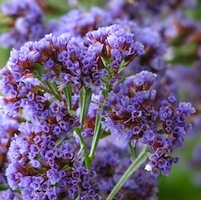 Native to many parts of the world, there are several different species of statice in the genus Limonium, which comes from Greek word for meadow. Often used in vase arrangements and bouquets, statice adds color and structure to a mix of flowers. The deep purple variety look lovely mixed in with soft alstroemeria and cheery next to bright gerber daisies. For a more natural, wildflower look, consider aster, zinnias or dahlias- all of which will be at their prime in mid to late September. Statice can also be dazzling on their own. Consider choosing stems of several different shades of purple and blue to tie together in a bouquet or cut short in a small vase. One of the most readily available and economical of cut flowers, the statice can be found year round at florists. Costing less than a dollar a stem, these flowers certainly won’t start your new year out with any debt and should last you right through to Yom Kippur.